The Stealth Razor helmet is a premium helmet that incorporates features that a good helmet should. Let's talk safety first. The lid is both DOT and BSI-6658 Type A certified. Many European helmets use BSI standards rather then Snell. As far as shell construction, AGV uses a carbon Kevlar fiber stratification and core system for strength and light weight in this helmet model. It has a "hump" for enhanced aerodynamics. Now let's look at the helmet's comfort features. 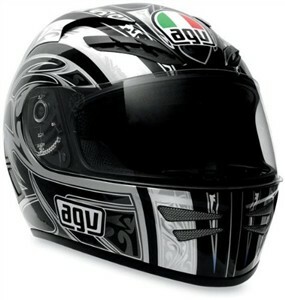 It incorporates what AGV calls a "Dynamic Ventilation" system with airflow vents and extractors. It also features something that I really like in a helmet, which is fully removable and washable padding. It includes a neck roll. I like the fact that the Stealth Razor uses a visor rotation mechanism without cover plates. This system is closer to Shoei's system than the cumbersome Arai system. I find the styling on the Stealth to be interesting, yet tasteful. The black version is my preference, but it also looks good in the blue, gold, and red motifs.